My Citizens, I wish all of you who reside in America a Happy Independence Day – a day which has inspired your glorious Leader to provide a recipe for that most beloved recipe at any 4th of July BBQ – potato salad! Ah, but not just any potato salad – this one is from Latvia and is both tart and refreshing! I have deliberately chosen a “foreign” recipe as opposed to the excellent American-style as a reminder that we are indeed a country of immigrants and that we are stronger with their unique culinary legacies and perspectives than we are without them! When food is involved, every Latvian will have their own recipe for everything and anything. Most heated discussions, however, revolve around the best pīrāgi dough and what is the correct way to make rasols. You see, I grew up in 80-ies with rasols made from potatoes, green peas, salted cucumber, “doctor’s sausage” and eggs. I know other families added boiled carrot and/or grated apple (but that’s just wrong as far as I’m concerned). But ask any Latvian that left the country pre-WW2 and they will tell you that rasols must have boiled beetroot and herring in it. Rasols was inspired by Russian or Olivier salad, invented in 1860s by Lucien Olivier, then the chef of famous restaurant Hermitage in Moscow. His recipe was a closely guarded secret, but the salad did contain rare and expensive ingredients – grouse, crayfish, caviar, smoked duck, capers – which would explain the richness of pre-war rasols. 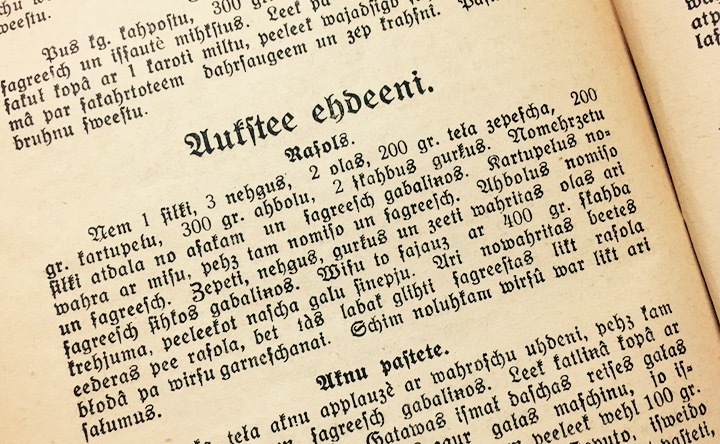 During and after the war many ingredients were not available and were replaced by simpler and cheaper substitutes – sausage for grouse, eggs for crayfish and pickles for capers – resulting in the version most Latvians will recognise as theirs. So what is real, undiluted rasols? Take 1 herring, 3 lampreys, 2 eggs, 200g veal roast, 200g potatoes, 300g apples, 2 salted cucumbers. Debone soaked herring and cut in pieces. Boil potatoes with skin on, then peel and cut. Peel apples and cut. Roast, lamprey, cucumbers and hard boiled eggs also need to be chopped in fine pieces. Mix everything with 400g of sour cream with added pinch (“naža gals”) of mustard. Boiled beets also suit rasols, but it is better to cut them nicely and use as a garnish on the top of salad. Herbs can also be used as garnish. My version of this recipe omits the usual sausage and goes for an ovo-lacto vegetarian version. I have played with the recipe to make it my own – I omit the green peas, add in pickled carrot instead of pickled beet (to avoid staining the salad purple), added in a touch of Latvian herbs and garlic and uniquely, a drop of the world-famous Latvian herb bitters! You can buy this – FINALLY – in the United States – get it here. I hope you enjoy my version of this wonderful dish, my Citizens – please also enjoy this wonderful dialogue about American liberty and justice! Blanch peeled carrots in a 4-quart nonreactive saucepan of boiling salted water 1 minute, then drain in a colander and rinse under cold water to stop cooking. Transfer carrots to a heatproof bowl. Bring remaining ingredients to a boil in saucepan, then reduce heat and simmer 2 minutes. Pour pickling liquid over carrots and cool, uncovered. Chill carrots, covered, at least 1 day for flavors to develop. Carrots keep, chilled in an airtight container, 1 month. Boil potatoes until fairly soft (but not until they are falling apart). Hard boil eggs. Remove skins from potatoes, and shells from eggs. Dice into fairly large chunks (about ½ inch (1 - 1.5 cm) in diameter). Dice other ingredients into smaller pieces. Put all diced ingredients into a very large bowl. Make salad dressing. Start with smaller amounts, and keep adding sour cream, vinegar, mustard, etc. until it tastes good to you. The salad dressing should taste somewhat salty and tart. Add salad dressing to diced ingredients. Stir well. Cover. Refrigerate at least overnight. No pupusa, however, is complete without being topped by the lightly fermented Latin-American kraut known as curtido! Curtido is a type of lightly fermented cabbage relish. It is typical in Salvadoran cuisine and that of other Central American countries, and is usually made with cabbage, onions, carrots, oregano, and sometimes lime juice; it resembles sauerkraut, kimchi, or tart cole slaw. It is commonly served alongside pupusas, the national delicacy. Fellow Central American country Belize has a similar recipe called “curtido” by its Spanish speakers; however, it is a spicy, femented relish made with onions, habaneros, and vinegar. It is used to top salbutes, garnaches, and other common dishes in Belizean cuisine. If you are a fan of delicious, probiotic-laden kimchi, I guarantee you will love this simple but flavorful cousin to it, my Citizens! 😀 I included a much simpler version in my previous recipe for pupusas, this is now my go-to version! Mine is based closely on the outstanding version I found at nwedible.com – I have added Mexican oregano to their version, and adjusted some amounts and types of the ingredients. A pickle crock is absolutely your friend in this recipe and can be used for so many other pickle recipes that it is a must-have, IMHO. You can get one here – be sure and get the crock, the cover and the weights all together! 3 small hot red peppers, minced - serranos are perfect! Clean and prepare a ½ gallon glass jar or fermentation crock for fermenting. Make sure it's scrupulously clean! Add all the prepared vegetables and the lime juice to a large, non-reactive bowl. Sprinkle the salt over the vegetables. With clean hands, massage all ingredients together until the vegetables begin to give off moisture, about 3 minutes. Transfer the Curtido to the clean half-gallon mason jar or crock, pressing down firmly with clean hands as you go to eliminate any air pockets in the jar. Weight down the ferment. There should be enough juice from the vegetables to rise up and fully cover the solids. If there isn't, add 1 tsp of fine sea salt to a cup of water, then add enough of this brine so that the liquids fully cover the solids. Loosely seal the crock or jar, and leave the Curtido at room temperature out of direct sun, for 2 to 5 days. Check the ferment daily. Look for bubbles and other signs of fermentation, burp the lid to release any pent-up carbon dioxide in the jar, and taste the development of the Curtido with a perfectly clean spoon. If you notice any scum developing on the top of your brine, skim it off promptly. When you like the taste of the Curtido after no more than 5 days, transfer the ferment to smaller jars for cold storage in the refrigerator, where it will keep for at least 6 months. My Citizens, your beloved leader, the zenith of munificence that is the mighty TFD, is a huge fan of southern American heirloom recipes, and this is one of the oldest! The incredible Andrew Zimmern, of “Bizarre Foods” recently visited Appalachia in Kentucky and was introduced to this amazing updated salad recipe by a local Chef. It blew me away – and I knew I had to post it to share with my loyal Citizens! Despite its name, this salad is in no way Scottish – “kilt” is southern slang for “killed” – as this is a salad with a hot dressing that wilts the leaves and is as savory and delicious as they come! Kilt Lettuce is not a type of lettuce, rather it is a dish of lettuce (or other greens) served warm. Think warm salads, such as spinach and radicchio with crumbled hot pancetta. You melt bacon fat, get it really hot, then add vinegar, water (sic), sugar and black pepper (standing back, of course, when the water and vinegar hit the hot fat.) You mix, then pour it over a waiting bowl of your salad greens, and then cover with a lid for a couple of minutes to allow the lettuce to wilt, then serve hot. Instead of using reserved bacon fat, you can fry up bacon, crumble it on the salad greens, and then dump the bacon fat from the pan on. You generally eat it with some kind of bread to sop up the grease and the vinegar. The bread could be cornbread, or baking powder biscuits. It might also be served with fried potatoes and / or fried salt pork. You can use any kind of leafy green: leaf lettuce, spinach leaves, creasy greens, etc. You can also include with the lettuce garnishes such as chopped boiled egg, sometimes early radishes, and ramps when in season. Wash and dry the greens and place in a salad bowl. Top with tarragon, parsley, turnips and radishes. Reserve. Place the slice of country ham fat into a large iron skillet over medium heat to render. Add the bacon. When bacon is crispy, use a mesh wand to remove the ham fat and bacon and reserve to a paper towel-lined plate. Return pan to heat. Whisk the brown sugar and vinegar into the hot bacon and ham fat until sugar is dissolved. Taste for seasoning and immediately pour dressing over the salad, tossing the greens in the hot dressing to “kill it.” Sprinkle with the bacon pieces and chopped ham fat. Serve immediately.